"The bitter political standoff in Wisconsin over Governor Scott Walker's bid to sharply curtail collective bargaining for public-sector workers ended abruptly Wednesday night as Republican colleagues in the State Senate successfully maneuvered to adopt a bill doing just that," The New York Times reports this morning. "Democrats....condemned the move as an attack on working families, a violation of open meetings requirements....and a virtual firebomb in state that already found itself politically polarized and consumed with recall efforts, large scale protests and fury from public workers." Rallies and demonstrations continue in the state. As heated as it's been, the rhetoric over unions is fast-approaching the boiling point; Wisconsin is just the beginning. The right accuses unions, especially public sector unions, of stifling economic competitiveness and putting state economies in the red. "The bottom line is we are trying to balance our budget and there really is no room to negotiate on that because we're broke," Scott Walker told George Stephanopoulos on Good Morning America. Or as Harvard economist Robert Barro wrote in the The Wall Street Journal: "Labor unions like to portray collective bargaining as a basic civil liberty, akin to the freedoms of speech, press, assembly and religion ....[but] collective bargaining on a broad scale is more similar to an antitrust violation than to a civil liberty." On the left, unions are seen as a bulwark against falling wages and the decline of the middle class. "Collective bargaining didn't cause the economic meltdown, and crushing unions won't solve it," Paul Toner, the president of the Massachusetts Teachers Association, protested in The Boston Globe. In a passionate defense of unions on the op ed page of The Washington Post, Yale's Jacob S. Hacker and Berkeley's Paul Pierson pointed out that unions "have resisted the rampant deregulation of financial markets and the soaring growth of executive pay. They have been one of the few organized voices that has consistently pressed back against the string of tax-cut bills for the rich that began in the late 1970s." For all the sound and fury, neither side has adduced much hard data to support their positions. While there have been many studies of the effects of unions on corporate profits and productivity, surprisingly few assess their effects on state economies. (One exception is a careful 1988 study by Harvard labor economist Richard Freeman, "Union Density and Economic Performance," which finds that union density improves earnings and income, but exacerbates unemployment and hurts growth.) But that was over twenty years ago. And so, with my colleagues at the Martin Prosperity Institute, I decided to take a close look at current data and trends for unions across the 50 states. For starters, there's huge variation in unionization levels across the U.S. states (see map above). Nationally, nearly 12 percent (11.9%) of workers are union members. New York touts the highest level of unionization in the nation, more than double the national rate at 24.2% percent. More than one in five workers are union members in Alaska (22.9%) and Hawaii (21.8%). Unionization tops 15 percent in an additional ten states, and it's above 10 percent in 14 more. Wisconsin ranks 17th in union membership, less than 15 percent (14.2%) of its workforce are union members. On the other side of the ledger, just 3.2 percent of North Carolina's workforce is unionized. Union members make up less than one in 20 workers in Georgia (4%), Arkansas (4%), Louisiana (4.3%), Mississippi (4.5%), Virginia and South Carolina (4.6%) and Tennessee (4.7%). While the conventional wisdom is that large numbers of workers are unionized in the Rustbelt states, that's more of a myth than reality. Less than one in five workers in Michigan (16.75%) belong to unions. The rate is 15.5% in Illinois, 14.7% in Pennsylvania, and 13.7% in Ohio. Unionization has fallen off massively in the past fifty years or so. Part of this is doubtless due to the transformation of the American economy from one that was primarily industrial to one that is more knowledge and service based. Still the numbers are staggering (see the graph above). Nationally, the percentage of union members declined by almost 20 percentage points (17.4) from 1964 to 2010. This drop has been much more pronounced in certain states, especially the older industrial states (see the map below). Union membership fell by more than 30 percentage points in Indiana, from 40.8% to 10.9%; from 39.9% to 7.3% in New Jersey and from 36.5% to 4.6% in West Virginia. Ten additional states posted declines of 20 percent or more. Wisconsin saw its rate of union membership fall from 34 to 14 percent. And 25 others saw declines of more than ten percentage points. All the posturing and sound byte-ready rhetoric aside, how do unions line up against key measures of state economic health? Are more unionized states less competitive, as right wing critics would have us believe? Conversely, do unions provide a bulwark against unemployment and other adverse economic outcomes? Relying on the steady statistical hand of my collaborator Charlotta Mellander, we examined the relationships between state unionization levels and key measures of state economies. As always, we remind our readers that correlation is not causation--we are simply looking at associations. Nonetheless, they tell a very different story than the ones you're most likely to hear. 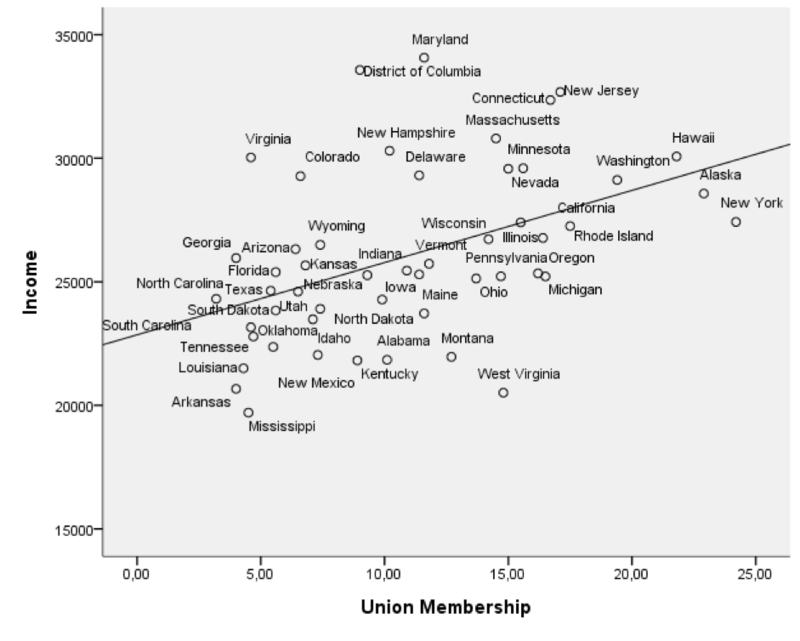 Unionized states are better-off economically than non-unionized states. While it's probably not surprising that unionization levels are correlated with higher hourly wages (.48), they are also correlated with higher incomes across the board--and the correlation between union membership and median income is substantial (.45). To put it baldly, unions are associated with the country's economic winners, not its losers. And it's not that unionized states work more--unionization is negatively correlated with hours worked (-.36). States with higher levels of union membership work less hours per week but make more money--higher levels of union memberships are positively correlated with wage per hour (.48). That said, unionization does not appear to mitigate the effects of inequality or to protect against unemployment, according to our analysis. There is no correlation whatsoever between union membership and income inequality. Union membership is not correlated with unemployment, either. Unions are usually thought to go along with blue-collar working class jobs. But that's not the case either, at least for state economies. 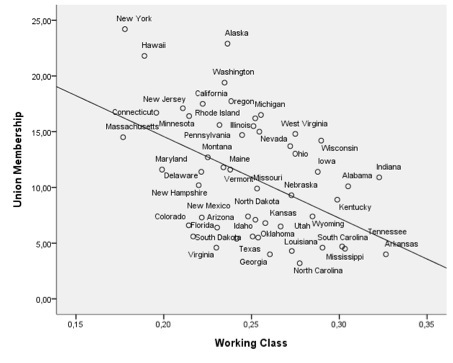 Union membership is negatively correlated with the proportion of blue-collar, working class jobs in a state (-.48). This too is a likely consequence of the ongoing transformation of the U.S. economy. As manufacturing unions have declined, service and public workers unions have grown. To that point, unionization levels are higher in states with more highly educated workforces and knowledge based economies. Union membership is moderately correlated (.3) with both human capital levels (the percent of adults with a college degree) and the share of the workforce in knowledge, professional, and creative jobs (.35). More surprising, unionization is even more highly correlated with the percentage of the workforce in artistic and culturally creative jobs (.53). 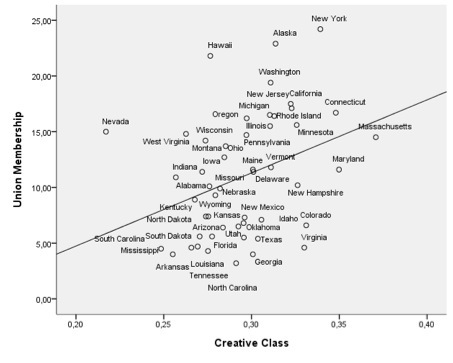 This is not to say that artistic and culturally creative workers are more likely to belong to unions (though some, like actors and musicians, do) but rather that states with more dynamic creative economies are also more likely to be highly unionized. It's also worth pointing out that unionization is more likely in states with higher levels of immigrants. Union membership is closely correlated with the share of adults that are foreign born (.42). Unions continue to be a hot-button issue in American politics despite the fact that the level of unionization has fallen precipitously over the past half century. While many continue to think of unions as the province of blue-collar working class economies, less than one in five workers in Rustbelt states - Michigan, Illinois, Pennsylvania, Ohio--belongs to a union. Union states have more knowledge-intensive economies, boast more highly educated workforces, and have higher incomes as well. The basic fact that unions are positively associated with so many key measures of prosperity suggests that their existence has little to do with state budget problems. Unions are not the cause of the serious economic and fiscal problems that are challenging so many American states, which are result of the economic crisis, collapsed housing market and massively reduced revenues. In fact, the economic influence of unions has been dramatically curtailed as a result of the ongoing transformation of the U.S. economy. At the same time, the existence of unions does not appear to be enough to forestall growing income inequality within the U.S, states. It's time to get beyond the angry, ideologically motivated rhetoric about unions. We need to put our fiscal house in order and buckle down to the serious business of generating good jobs; more than that, we need to reinvent the U.S. economy for this new age.